I learned something today: there are only two all horror bookstores in the United States. One of those two is in the state of Texas. And Dallas, that one is right here in our own backyard… if you have a 30 mile backyard, that is. Eerie Books, located about twenty miles northeast of downtown Dallas, is a far piece to drive for me coming from the opposite side of the city, but dammit! it was worth the trip. 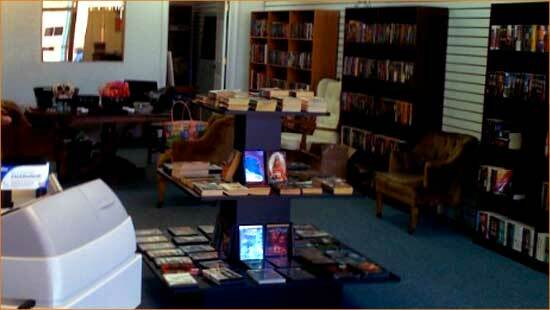 Opened by Randy Ray in 2008, Eerie Books is a veritable oasis for the horror fan. Books circle the wall: new books, used books, audio books, comic books and even kids book books – all horror. I knew I’d found paradise when I discovered the Lovecraft shelf. It totally set my pineal gland to tingling. Of course, they just aren’t all about books. There are games of the video and tabletop version.What kind of games? I’m not going to tell you. You owe it to yourself to visit. Need another reason to visit? Check out their Book Club. Every first Thursday, they gather for libations and to discuss a different horror novel. Again, something that, to me, would make any long drive worth it. They even have a story time for kids every Thursday and Saturday at 10:30AM. Why wait to traumatize them? So, whether it in the neighborhood for you or a sizable excursion, make your way to Eerie Books. They are located at 205 N. Ballard Street in Wylie, TX and are open 2PM to 10PM Tuesday through Saturday. For more information you can call them at 972-442-9393 or visit their website at http://www.eeriebooks.com/. You can even follow them on Twitter: @horrorbooks.